The shop board made with Wood reminds of similar eateries up in the Himalayas. 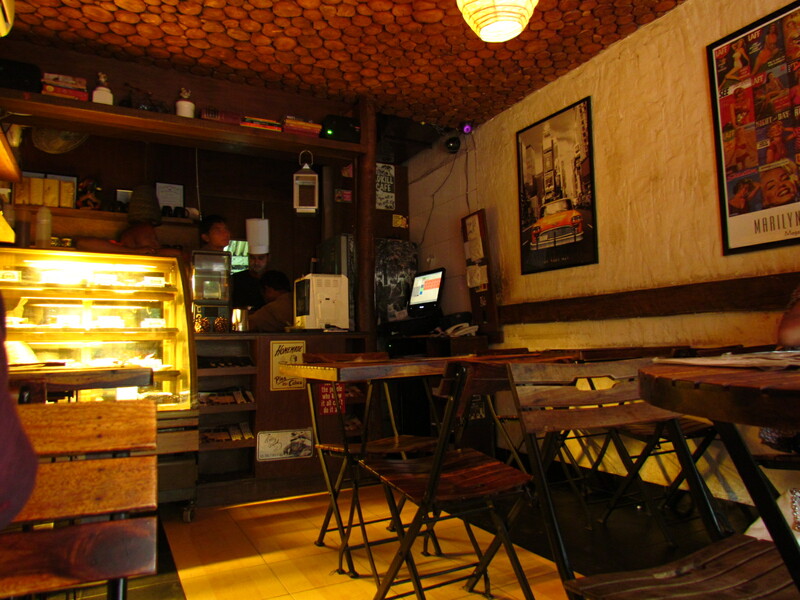 The eatery is tiny with a very warm decor. Seating is with simple lightweight & good looking metal-wood combo furniture. Huge retro posters adorn the walls. Retro music plays in the background quite loud – Good enough to let u talk with ur partner while njoying the music at the same time. 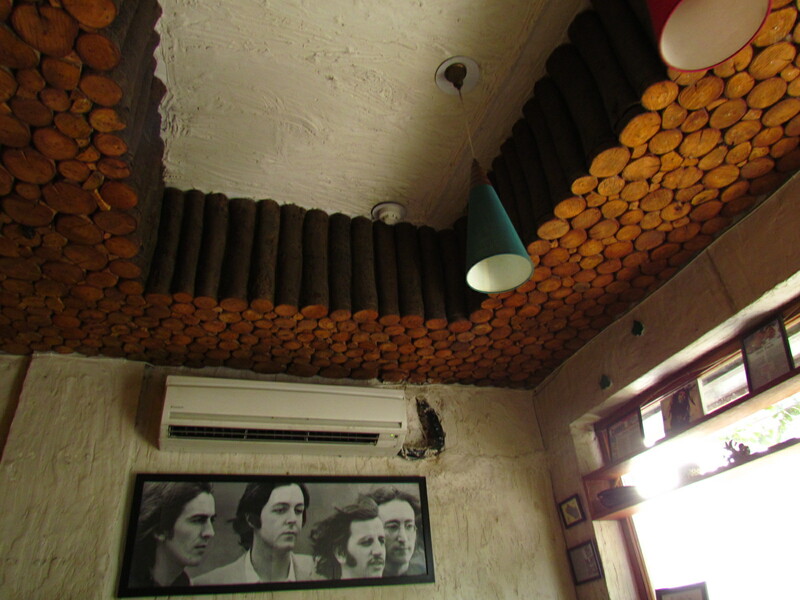 The ceiling is too curious – It looks like ‘made of logs’. Beyond the super tiny seating area is a pastry counter that showcases some really ‘mouth-watering look cakes’. As I mentioned above, the space is small & the seating is packed – so chances that u will hear the debates / discussions of the next table & vice versa but thankfully nothing of that sort happened to us. While people came & went, it was never 100% full & hence the table next to us was empty for the 2 hrs we spent here. 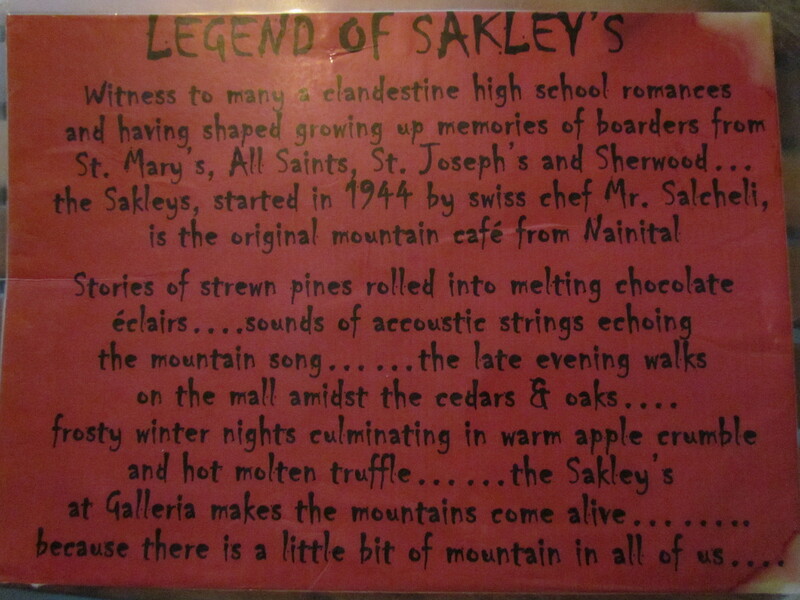 As we sat, we came across a very cool writeup on Sakley’s – Must admit that after reading this, I remembered my ‘high school’ day romances & I was lucky that the same person I romanced back then, was sitting right in front of me here at Sakley’s 🙂 & over the next 1 hour I watched the sun setting in her backdrop. 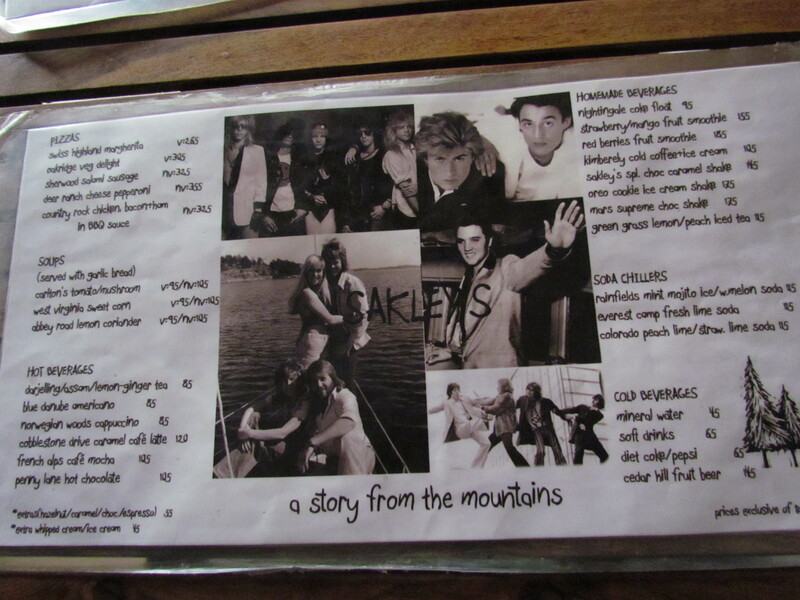 The menu card was cool – great concept & good artwork. Someone really used a lot of dimaag while conceptualizing this. Sadly, it was badly physically mangled at the corners – the lamination had gone for a toss. Reprinting / relamination doesn’t cost a lot & is surely due for the menu cards here. Food was better than I had expected here. Drinks were good but not ‘I have not have it so good ever’ variety. The portions of food were huge. So cud not try much at a go. Will try some more variety sometime later. We started the evening with a tasty & refreshing Fruit beer – much better than the bottled variety available at Dilli Haat. Old Chapel Ham Bacon Sandwich with sausages + egg in melted cheese came next. It looked normal but I was pleasantly surprised to find that it tasted abnormal (much better than average), specially since it was made not with some facny inhouse baked bread but with normal brown bread). Infact the sausage also looked like any other machine-made meat paste’ tasteless sausage that we get to buy at supermarkets in Gurgaon these days. However, it turned out to be pretty different, soft, juicy, flavorful & surely much much better than the ones described above. A peep into whats inside ‘Old Chapel Ham Bacon Sandwich with sausages + egg in melted cheese ‘ revealed a neat juicy egg omelette. 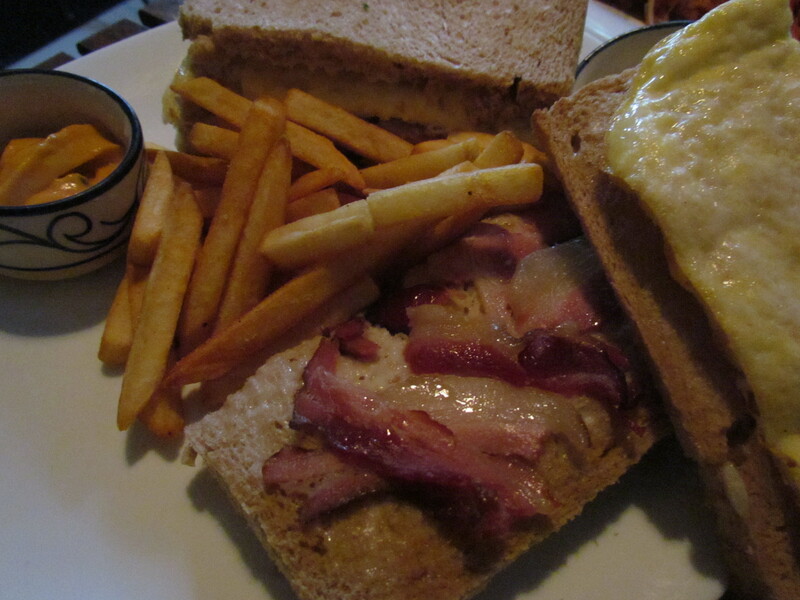 I also got to see the bacon – superb & thats when I guessed the taste wud be good & so was it. 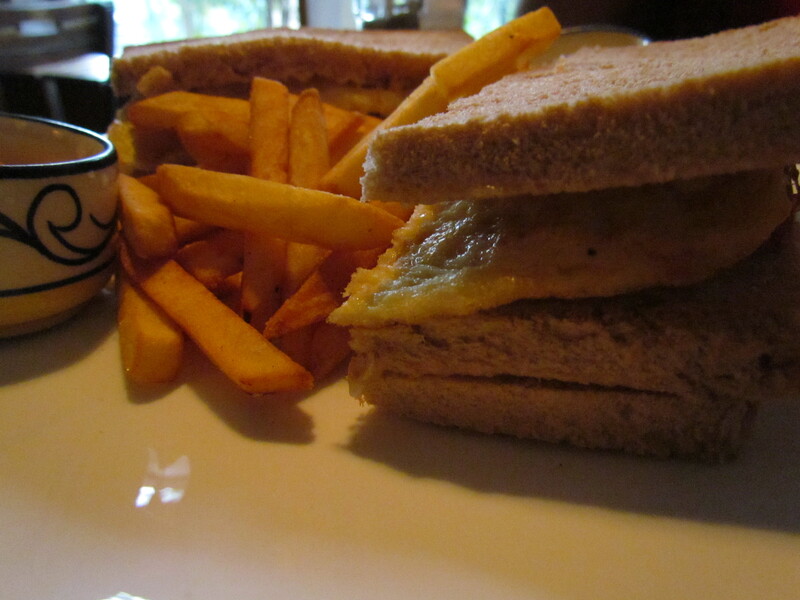 The bread was toasted to a ‘semi crunchy’state – just perfect texture for such a sandwich. Super liked it. Next came a ‘Gordon House Lime garlic Pasta with prawns’. First reaction on seeing the pasta – looks a bit too tomatoee. However, as the pasta landed on the tastebuds, the inhibitions flew out of the windows. The tastebuddies rejoiced. I added a dash of red chilli flakes & oregano & the taste exceeded expectations. 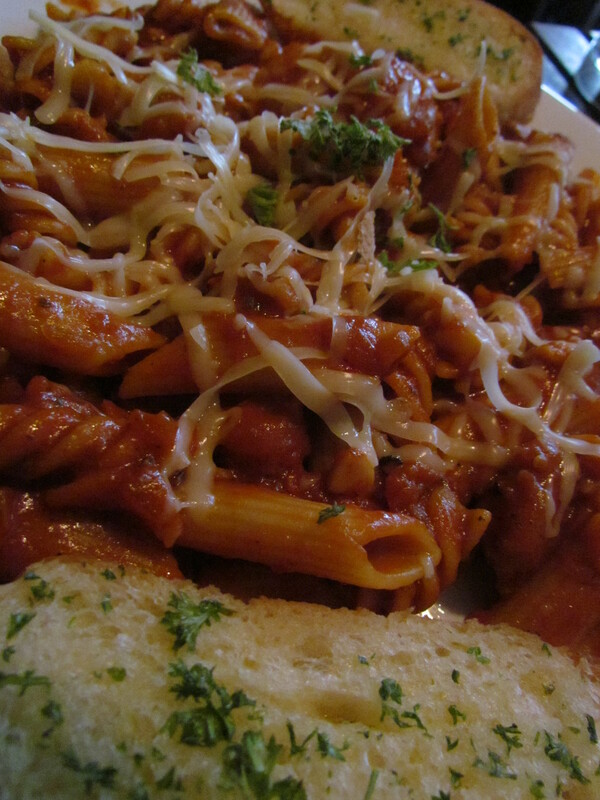 The pasta was a bit more on the sour side but I liked it. 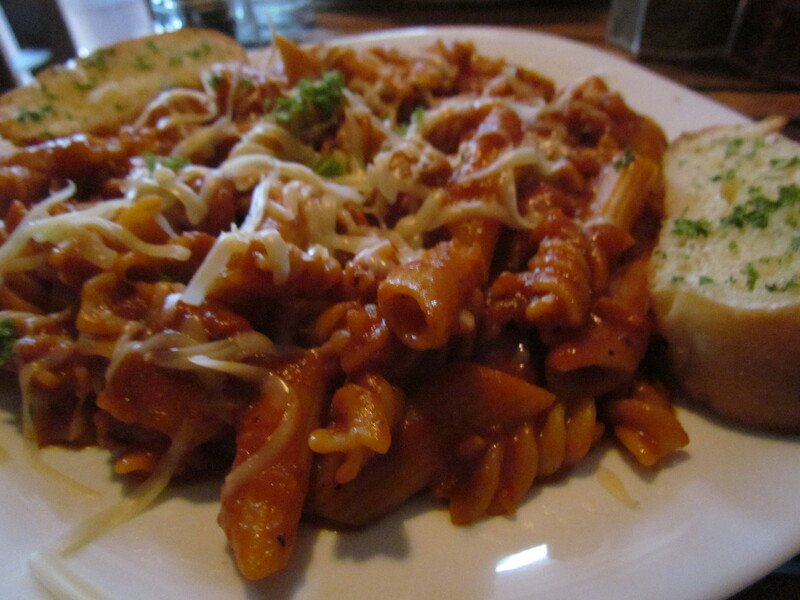 Whats interesting was that two types of pasta were used – penne & fusilli. Shredded cheese was used as a garnish on the top, along with the customary herbs. The garlic bread however was not crunchy enough on the edges – issues with texture. However taste wise it was not bad. 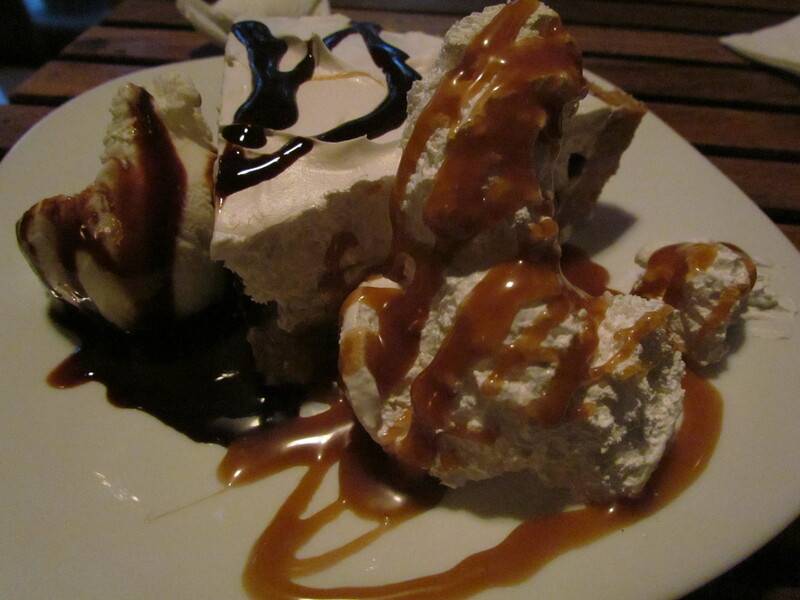 For dessert we had Banana Toffee pie. This was accompanied with whipped cream on which sticky caramel has been poured & also a scoop of vanilla flavored ice cream with molten chocolate poured on top. I am not a huge fan of banana based desserts but really liked this one. The base of the pie was thick, not so layery / crunchy (as wud have been expected from a true blue bakery) & was topped with the banana layer & a layer of white cream. 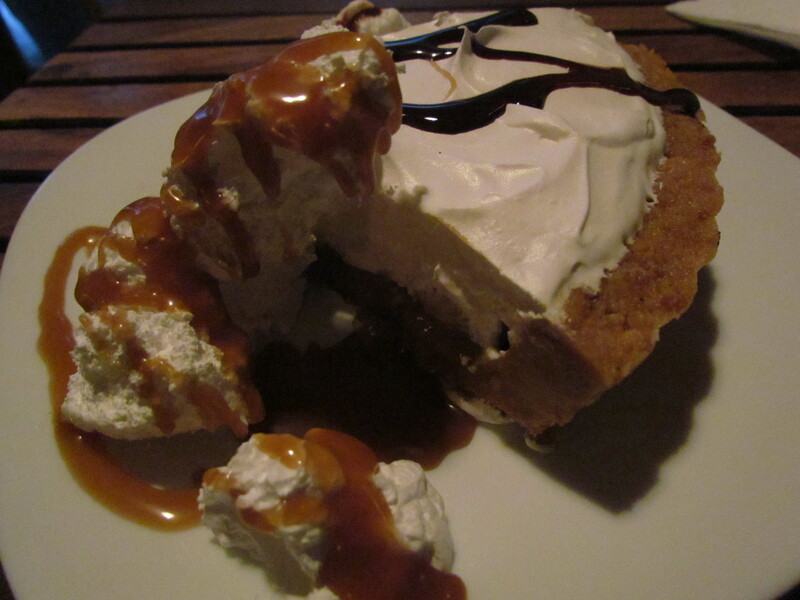 The combo of caramel & unsweetened but slightly salty whipped cream went well with the pie. The other combo was usual – chocolate & ice cream. …………………… Its different that I walked 5 km this morning to burn those extra creams of last evening. We also got a Chocolate cake with strawberries packed. 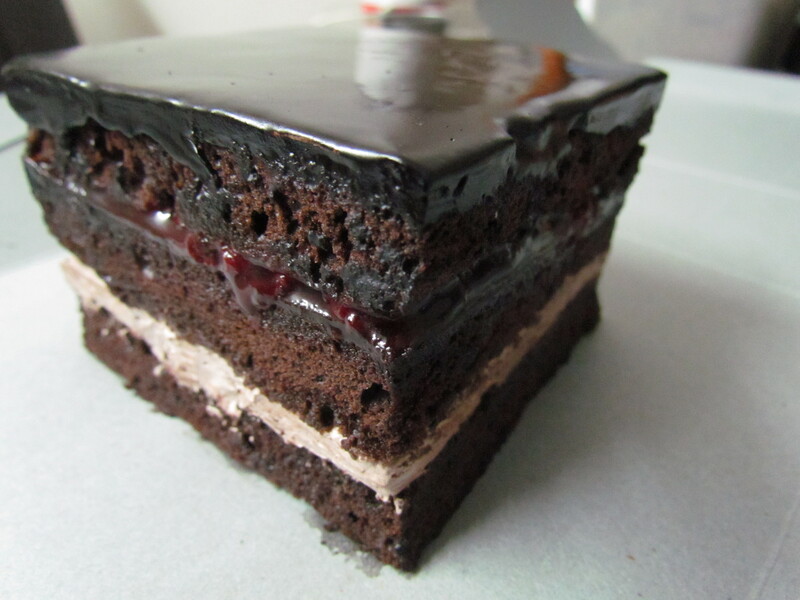 It had a glazed chocolate upper layer & layers & layers of cake & dark chocolate with one layer of real fruity strawberry muddle. Good but not great. The strawberries did not make their presence felt. To conclude on the cakes part, if I am ‘cake hungry’ in Galleria, I might rather go to L Opera. 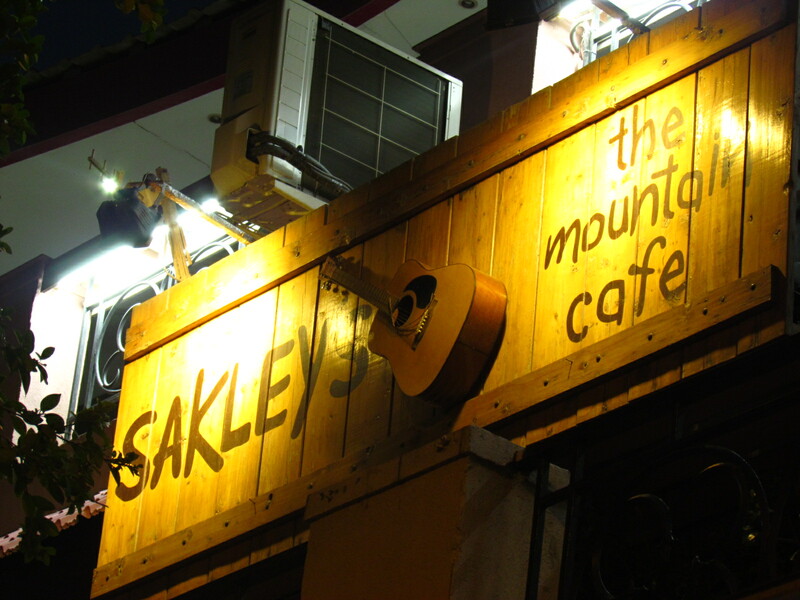 If I am at Sakley’s anyway, I might as well have it here. 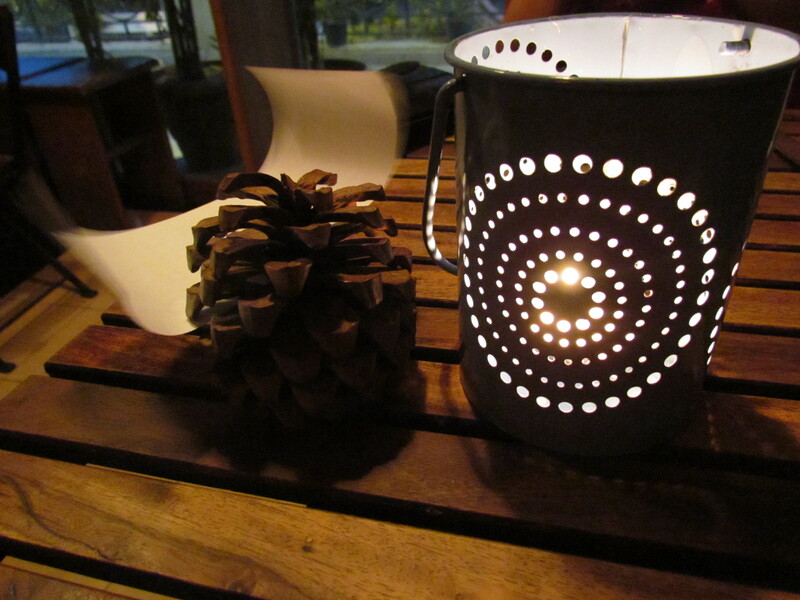 The two interesting things that came in by the time we were about to leave – a pine fruit & a perforated cup. When we reached, Mr. Sun was still around. By the time we were leaving, Mr Sun had gone to bed. Realizing this, the gentleman serving us placed on our table a cup having designer perforations & a burning candle inside. Overall – Liked the experience. Will revisit. Wow! 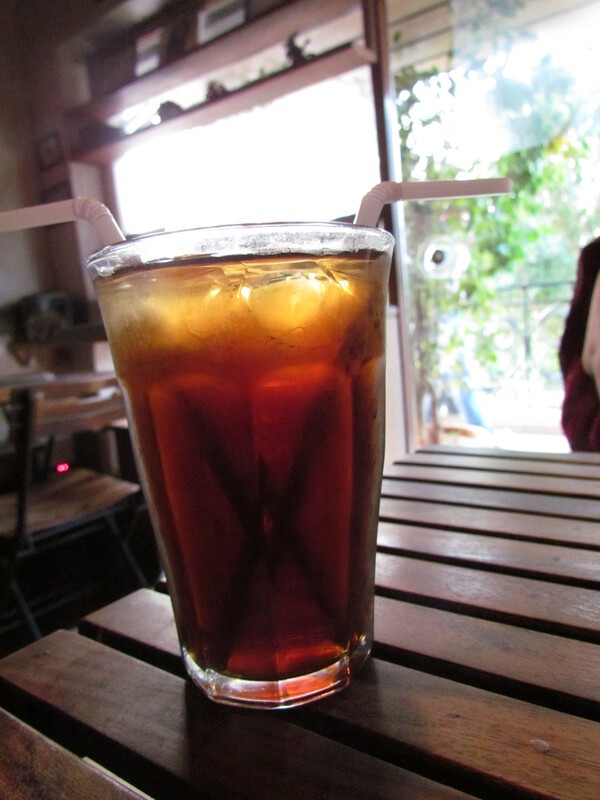 How amazing and creative… Just curious about why they gave the perforated cup for? Was the pine fruit real? The perforated cup had a little candle in it – so in an othrewise dark setting it was a source of light & the perforations made sure that the light spreads out in the same pattern. Try their Pizza and Oreo shake next time…would like to know your views on their pizza. Also I read your review on zomato on this eatery, where you’ve started off your review with “I give 3.5 to Sakley’s but since decimal is not an option in Zomato, I am pressing the ‘4’ button”, but throughout the review I could not find your clarification on the reason of this discretion. Elaborate please.